Jerusalem, Israel — June 29, 2018 … Last night, during a special IDF operation, humanitarian aid was transferred to Syrians fleeing hostilities and who are presently living in tent camps throughout the Syrian Golan Heights. 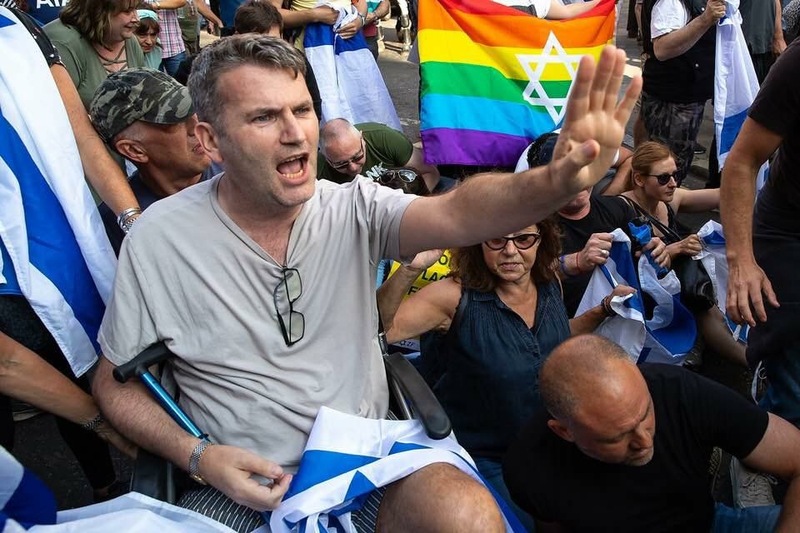 The IDF has provided life-saving humanitarian aid to Syrian civilians through “Operation Good Neighbor” for several years, as a good-will gesture, while maintaining a policy of non-intervention in the Syrian conflict. As part of the operation last night that took place over several hours, 300 tents were transferred to Syrian civilians along with 13 tons of food, 15 tons of baby food, three pallets of medical equipment and medicine and 30 tons of clothing and footwear. 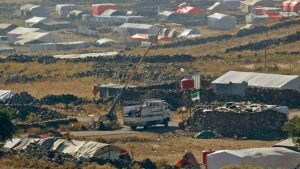 Thousands of Syrian civilians are presently living under poor conditions in these camps near the Israeli border, often lacking access to water, electricity, food, and other basic necessities. The UN’s Syrian envoy Jan Egeland said Thursday that humanitarian shipments to Deraa and the southern region of Quneitra have been disrupted since June 26. “The extremely effective lifeline from Jordan across the border has been discontinued due to the fighting in recent days,” Egeland told reporters. 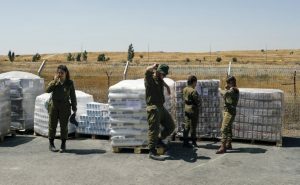 Israeli soldiers stand next to food supplies being prepared for Syrian refugees at an army base in the Golan Heights. Assad’s offensive in the southwest has been backed by air strikes and shelling that have killed 96 civilians since June 19, the Syrian Observatory for Human Rights war monitor said, including 49 on Wednesday and Thursday. The IDF states that it is closely monitoring events transpiring in southern Syria and is prepared for a wide variety of scenarios, including additional humanitarian aid distribution to Syrian men, women and children. 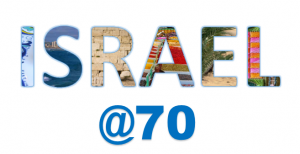 Israel is renowned for responding to humanitarian crises in Gaza and distant locales such as Haiti, in the aftermath of the devastating 2010 earthquake, Nepal, and Japan, following the Fukushima nuclear meltdown. 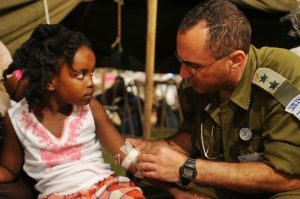 IDF humanitarian aid missions have helped thousands around the world for over 26 years, with 15 aid missions to countries struck by natural and man made disasters. 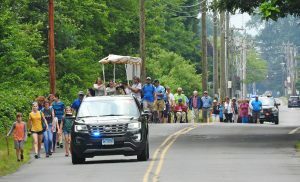 South Windsor, CT — June 25 … “When a synagogue needs to close its doors, it is never good. However, we found a way to make the most and bring honor. 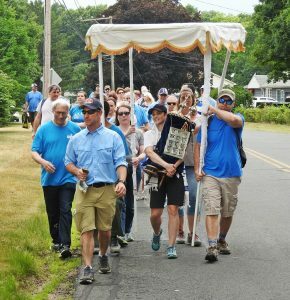 After an emotional open house and last Shabbat service, Temple Beth Hillel joined Congregation Beth Ahm and set out to carry the Torah the ten miles from Windsor to South Windsor. We carried it under a chuppah (wedding canopy). Along the way, names of the Torah portions were put on signs. At each new portion, we gathered the group, read the name and called “tekiya” to prompt the shofar carriers to blow. Churches rang their bells as we passed. 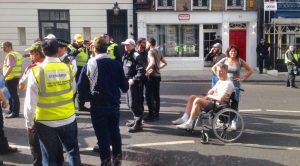 What started off as somber lightened as people from both synagogues shared the walk and talked with each other. Halfway into the walk, we came to the Connecticut River. We reenacted the crossing of the Red Sea. The exodus from Egypt was marching into the uncertainty of the desert, yet we found a way to sing and dance. This was the same. We found a way to sing and dance across the river. Rabbi Alan Lefkowitz and Rabbi Jeffrey Glickman take a well deserved rest after walking from Windsor to South Windsor, CT in a ten mile Torah march. When we arrived at Temple Beth Hillel, there was a Klezmer band and we shifted into wedding mode. The parade circled the parking lot 7 times, then the Torah was handed from person to person, across the threshold and into the sanctuary where a bar mitzvah read the portion of the week, “Ma tovu ohalecha Yaakov…” “How good are your houses…” the first lines a traditional Jew recites when entering the synagogue in the morning. “We have just carried the Torah 10 miles. It was a challenge, but not a burden. 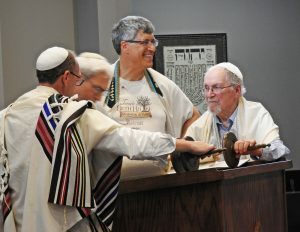 Congregation Beth Ahm has carried Torah for several decades. It was a challenge, but not a burden. When a major project has ended, we recite, chazak, chazak vnitchazek, It is strong, strong and may we be strengthened by it. The emotional walk has ended, as has the glorious decades of Jewish spiritual presence in Windsor. 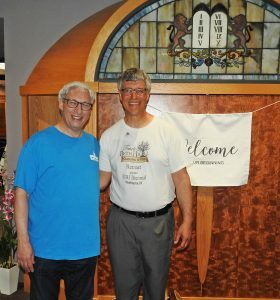 Rabbi Jeffrey Glickman serves as spiritual leader at Temple Beth Hillel, on Baker Lane here in town, where he teaches “This is a house of prayer for all peoples.” Since arriving in South Windsor in 1995, his commitment of uniting diverse people remains central to his values. Rabbi Glickman is the current president of the Greater Hartford Rabbinic Association.